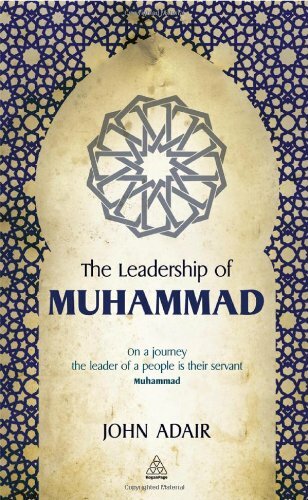 The Leadership of Muhammad is a new book by British management scholar John Adair that mines the life of the Prophet Muhammad to highlight his extraordinary qualities as a leader. According to Adair, success is a function of leadership, and his short work provides anyone interested in learning how to lead and motivate with a wealth of insight, according to this review by Muqtedar Khan, an associate professor of political science and international relations at the University of Delaware. Over the years, Muslim and non-Muslim historians have written many books about Prophet Muhammad as a leader, highlighting the divinely guided qualities of his personality as the final messenger of God, according to Islamic beliefs. But in the past century or so, a modernist, rationalist school of Islamic thought has emerged, which focuses on examining Prophet Muhammad as a charismatic leader as well as being the messenger of God. Developed by thinkers like Sir Syed Ahmed Khan and Shibli Nomani in India and Sheikh Muhammad Abduh and Rashid Rida in the Arab world, this school seeks to minimize the miraculous nature of the Prophet’s biography to explore the rationalist and humanist dimensions of his personality. Their interpretations are formed by many categories that guides modern thinking — the Prophet Muhammad as statesman, as a businessman, as a political leader and a spiritual guide. British management scholar John Adair’s new book, The Leadership of Muhammad, joins this body of work, even though he is not a modernist Muslim. But Adair’s interpretation is different from most Muslim biographers of Prophet Muhammad in several key ways. First, Adair, who served with a Bedouin regiment in the Arab Legion, emphasizes the context in which he lived over abstract moral principle. His narrative is rich with discussions of tribal practices and the day-to-day habits and traditions that had an influence on Prophet Muhammad. If Adair’s goal is to argue that leadership styles must conform to the cultural context in which they find themselves, he succeeds. In episode after episode, he shows how Prophet Muhammad’s understanding of the tribal norms of Arabia helped him become an inspirational leader as well as an effective manager. Adair is singular in his focus on Prophet Muhammad as a leader. Unlike other commentators, he does not aim to explain or glorify Islam and Islamic teachings, and this allows him to home in on the aspects of Prophet Muhammad’s personality and cultural context to illuminate his leadership qualities. Metaphors, such as comparing leaders to shepherds, and adjectives like humble and courageous appear frequently throughout the book. A good shepherd guides his sheep, unites them, works for their welfare without taking advantage of them and cares for each individual. Adair sees those characteristics in the Prophet Muhammad. Not only did he care for the well-being of each and every member of his flock, he was uncompromising in his determination to protect the integrity of his mission. Adair conveys many nuggets of wisdom about what constitutes leadership, how it can be developed and understood, using a simple narrative style to tell the story of a very special man, one who was at once a business leader, a political authority, a community activist, a social entrepreneur, a divine source and a humane role model. Adair has strong views about what makes great leaders stand out. They lead from the front and lead by example. They must eschew arrogance, exude humility, be truthful, be prepared to share any hardship with followers, and provide both vision and dedication to achieving a task at hand. Success to Adair is a function of leadership, and Muhammad — as a prophet who transformed Arabia and much of the world with his teachings — could not have achieved success without being a good leader. This is the unstated assumption that holds the book together. As Muhammad was walking up the line straightening it with an arrow in hishand, he came to one Sawadi Ibn Ghaziya, who was standing too far out of line. “Stand in line, O Sawadi,” the Prophet said, gently pricking him in the belly with his arrow. “You have hurt me, O apostle of God,” Sawadi cried, with a much-exaggerated cry of pain. “God has sent you to teach us about right and justice, so please allow me to retaliate”. “Take your retaliation,” said Muhammad with a smile, uncovering his own belly. Sawadi kissed it and embraced him. “O Messenger of God,” he said. “You see what is before us, and I may not survive the battle, and as this is my last time with you I want my skin to touch yours.’ Muhammad then blessed him. With soldiers like that you tend not to lose battles. Elsewhere, Adair captures the love and affection that Prophet Muhammad’s followers showered on him. As the thinking goes, You can be appointed a commander or a manager, but you are not a leader until your appointment is ratified in the hearts and minds of those who you lead. After Prophet Muhammad agreed to the terms and conditions in the peace treaty imposed by the Quraysh tribe at Hudaybia, many of his companions were profoundly upset with him, since the terms were favorable to the enemy. All of his companions refused to obey a direct command of his, which was to make the sacrifices and complete some of the rituals of the Hajj. Prophet Muhammad, saddened and worried by this development, retreated to his tent where his wife Umm Salama, advised him to go back out and silently perform the very acts he had ordered. When his companions saw him lead by example, they immediately followed him and a major mutiny was averted. At a time when the public sphere is filled with Islamophobic narratives determined to caricature the noble Prophet and demonize the Islamic faith, this cameo about his leadership lessons comes as a welcome and edifying relief. Previous Is Religion A Tool Of Social Control?